Can’t wait any longer for Native Apps? Me neither. (Late) June seems too far away? I’m with you. So why wait, when you can jailbreak! Over the next couple weeks before 2.0 is released, I’ll give you guys a glimpse into the jailbroken world of native apps every week. Plus: let’s face it, Jailbreaking isn’t going anywhere. The SDK is awesome, but some people won’t settle for anything less than full-on access to all the hidden bits of the iPhone. In this week’s edition, we’ll take a look at a nifty little program called IntelliScreen. 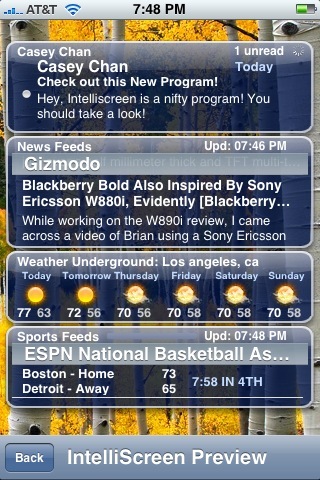 The idea behind this native app is smart, it creates a ‘Today’ screen for your iPhone’s unlock screen. Much like certain layout options in Windows Mobile and Blackberry, Intelliscreen offers a quick look at your calendar, mail, SMS, news, and weather. How well does this native app perform? Does it offer a great feature for users? It is also important to note that the program is currently in beta. There are still some bugs out there, but many of the problems have been resolved. The basic layout of IntelliScreen consists of bubbles for each separate category. The transparent bubbles lay on top of your iPhone’s wallpaper and gives you a quick look at your upcoming activities, new mail & sms, and some news feeds and weather forecast. 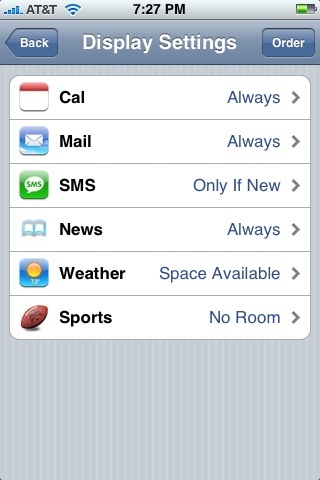 The settings page of the program matches the integrated settings of the iPhone. The design simplifies the customization of IntelliScreen and offers a multitude of options for the user. However, the overall design of the native app leaves a lot more to be desired. The bubbles are decent at best, but because the screen doesn’t entirely replace the wallpaper, it looks very cluttered. Also, it would help if the bubbles were different from one another or if they replace the bubbles altogether. In this current version, the layout lacks the stylistic cues that make apps on the iPhone go ‘boom’. Aside from its cluttered and unexciting layout, I really found IntelliScreen to be quite useful and extremely well integrated. 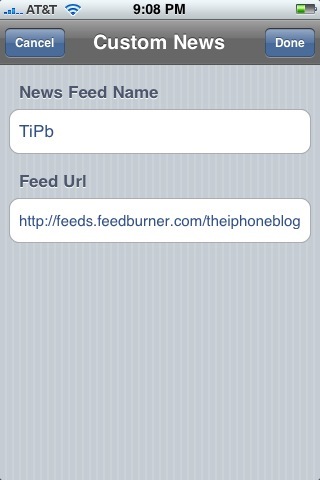 You can customize news feeds to your liking (try our TiPb RSS feed!) and determine which order of categories you would prefer. I found myself just checking the lock screen instead of unlocking the iPhone and running through the programs. It provided an easily accessible screen that notifies the user of any impending appointments and messages. There are also simple touches that I enjoy, like if you see something interesting in any of the bubbles, all you have to do is slide your finger to bring up a ‘Launch Mail/Safari/Calendar’ button. This feature is great to immediately access your Mail or quickly read up on whatever news you found interesting. Also, the program notifies you of updates within the program, which is quite different from other jailbreaking apps which only notify you through Installer.app. A great feature to implement into Intelliscreen would be a to-do list. I could imagine IntelliScreen using a jailbroken app for its to-do list and to display in one of the bubbles. I can’t fully recommend this program because it is still in the beta stages and still quite buggy. Though a simple reset of the iPhone did the trick, many users should be aware of the potential screen freezes. Most of the bugs occurred when I was trying to capture a screenshot of the program but there were still a few issues in daily use. Also, my battery seemed to drain a tick bit faster than it usually does, so proceed with caution. The idea behind IntelliScreen is something that Apple should strongly consider implementing in future firmware updates. Though the program still needs a lot of work and perhaps a few design changes, Apple should at least include a ‘Today’ screen as an option. 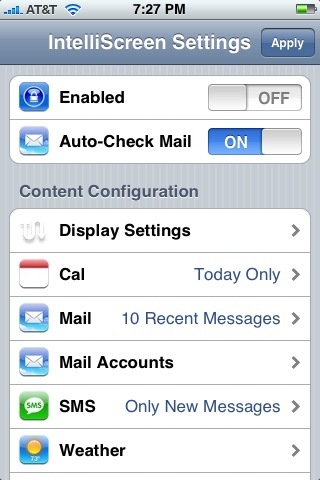 Because there isn’t a notification for new e-mail on the iPhone’s unlock screen, I found that using Intelliscreen allowed me to quickly check everything I needed to do without ever having to unlock my phone. This native app is a feature that is included with almost every other smartphone. This current beta iteration can be forgiven for its flaws in stabilitiy and boring design, but when it officially releases I can fully see this being one of the most popular jailbreak apps. When all the kinks get worked out, this may be the ‘killer app’ that iPhone users have been waiting for.